BentoLunch.net - What's for lunch at our house: What's for Wednesday??? 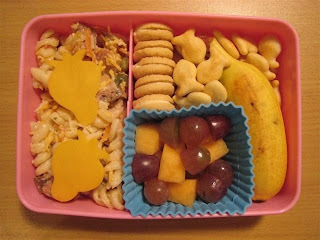 Wednesdays are supposed to be hot lunch days, but Miss Faith decided she didn't like the hot lunch choices and Mr. Ben doesn't actually get hot lunches at school. So I got stuck sending two lunches today, what a thrill. However, it is infinitely helpful if one realizes this information sometime before 11:30pm on Tuesday night on the way to bed. Despite the time crunch, I figured out a plan. 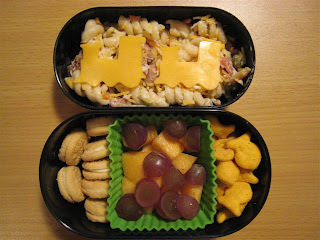 Ben also got the same pasta salad/sausage combo, but his cheese was shaped like trains, ranch Goldfish, vanilla mini Oreos and canteloupe & grapes. His box didn't fit the mini-banana and he's not always a huge lunch eater, so I left it at that. I'm lovin' the mini banana's! Do they taste the same. I've been pretty timid about buying them. My kids won't eat the mini-bananas. They say they taste funny. Annoying little cretins. ;) I love tiny food!